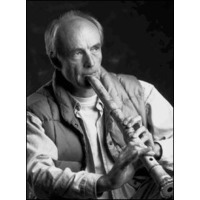 Deuter is a German New Age instrumentalist and recording artist known for his meditative style that blends Eastern and Western musical styles. Born Georg Deuter in 1945 in post-war Germany in the town of Falkenhagen, he taught himself the guitar, flute, harmonica and "just about every instrument I could get my hands on," though it wasn’t until after a near-fatal car crash in his early twenties that he decided to pursue a career in music. His first release in 1970, entitled D, is widely acknowledged as a Krautrock classic. D marked the beginning of Deuter’s spiritual and musical journey, ostensibly paving the way for a new genre of music known as New Age, which combined acoustic and electronic elements with ethnic instrumentation and nature sounds, such as whale and bird song, the open sea, wind in the trees, etc.